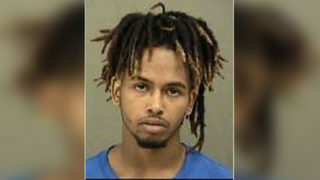 CHARLOTTE, N.C. – The 17-year-old driver accused of leading police on a chase through north Charlotte Friday afternoon is set to face a judge Monday. Thomas Lindsay, along with a 16-year-old and two juveniles to young for police to release their identities jumped from a stolen car in a north Charlotte neighborhood after trying to flee from police Friday. Chopper 9 Skyzoom was overhead as police followed the vehicle and it weaved in and out of traffic across the city. 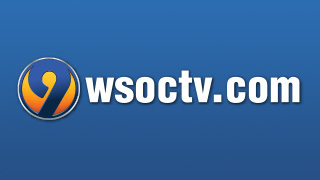 Police said a license plate reader hit around 2 p.m. on Independence Boulevard in Charlotte, indicating the vehicle had been stolen two days ago in Huntersville. Officials were able to follow the vehicle on cameras from the real-time crime center until responding officers were able to get there. Police said officers attempted a traffic stop and the vehicle did not stop. Officers did not pursue the SUV but the police helicopter was following it. 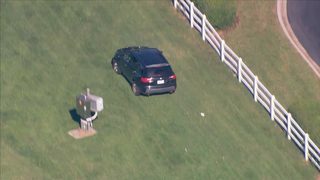 Chopper 9 Skyzoom saw the vehicle as it moved erratically and sped from I-277 to I-85 to Beatties Ford Road. The driver then ran off the road to get around traffic near Harris Boulevard and Statesville Avenue. We captured the moment when four people inside the vehicle jumped from the moving SUV and took off running at the intersection of Twin Drive and Wondering Oak Lane. The abandoned vehicle was left in drive and crashed through two fences then fell into a ditch on Voeltz Drive in a neighborhood off Old Statesville Road. One neighbor told Channel 9 he did not know what was happening but saw several helicopters circling above. “That’s pretty snappy. Seems like they did it pretty quick and efficiently,” neighbor Steven Ribbeck said. Police first took three people into custody, then conducted a door-to-door search. “I just thought it was a crazy Friday and somebody had messed up,” Ribbeck said. They were also able to take the fourth person who was in the car into custody. Lindsay was the driver of the vehicle and was charged with felony flee to elude, felony hit and run, possession of stolen motor vehicle and resist, obstruct, delay. Lindsay is expected to face a judge Monday. Deron Ealy,16, was arrested and charged with resist, obstruct, delay. Two juveniles who were in the vehicle and ran from officers were also apprehended. They were charged with resist/obstruct/delay and turned over to their parents or guardians. Their names will not be released due to their age. While all four suspects were eventually tracked down, police did, mistakenly, handcuff a child who was not involved. Channel 9 spoke with the father of the young boy, who was upset about the mix-up. The boy was released once officers realized he was not a part of the incident. Police are now working to get the vehicle towed and interview the suspects to see if they had any knowledge of the car being stolen.